Alice Lopez, one of the strongest champions of cultural ties between Native American Wampanoags and St. David’s Islanders descended from members of the Massachussetts tribe, has died suddenly. She was 49. Ms Lopez – an activist on behalf of Wampanoag housing rights on Cape Cod and a walking respository of tribal lore – collapsed at her home in Mashpee, Massachussetts on New Year’s Day and died soon afterwards. “She enjoyed socialising and celebrating life and was well known, well respected and well loved by many both within the tribe and the wider community,” said an obituary posted by a Mashpee funeral home. “She loved travelling to Powwows and tribal social gatherings throughout the United States. 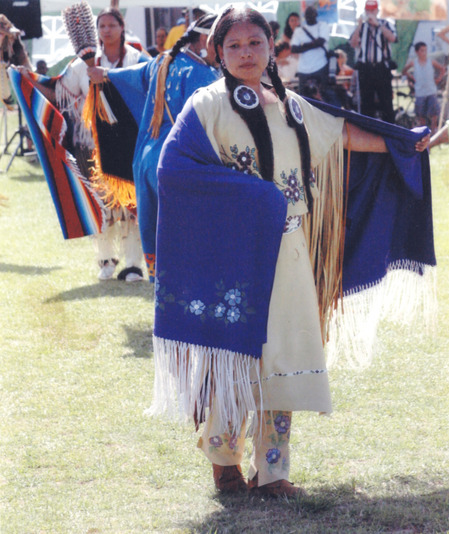 “She especially enjoyed annual trips to St. David’s Island in Bermuda (she is pictured at the 2009 event above) where she attended Powwows held by the descendents of Wampanoag sold into slavery there after King Philip’s War in the 17th century. Ms Lopez — usually adorned in traditional Wampanoag regalia – had been a familiar figure in Bermuda since 2002, when ties between the Native American tribe and their St. David’s kinsman first began to be celebrated at Reconnection Festivals. In recent years, St. David’s Islanders along with Gombey troupes– a Bermuda tradition which incorporates Native American elements brought to the island by Indian slaves – have also attended Wampanoag festivities Ms Lopez helped to organise in Massachusetts. A performance by Bermuda Gombeys at the 2009 Powwow in Mashpee is shown below. Ms Lopez is survived by two sons, her mother, four sisters and two brothers. A funeral will be held Saturday, January 8 at 11 am in the Old Indian Meetinghouse in Mashpee with burial to follow in the Old Indian Cemetery. A traditional Native American sunrise ceremony will also be held at the Old Indian Meetinghouse at 7 a.m. Donations in her memory may be made to the Mashpee Wampanoag Housing Department, c/o The Mashpee Wampanoag Tribe, 483 Great Neck Road South, Mashpee, MA 02649, USA. Thank you for allowing others to know of our great loss both here in BDA and her family and friends in Mashpee, MA…. Alice Lopez was a wonderful, giving person to our families on St. David’s Island. We will miss her knowleddge and caring.